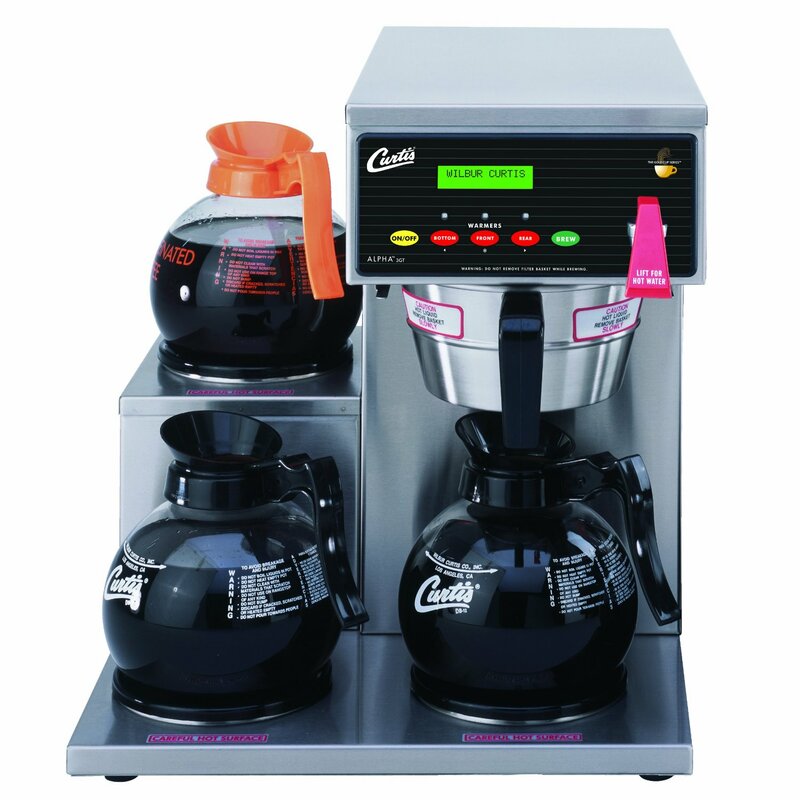 Well designed, convenient, and simple to use, the Wilbur Curtis commercial coffee machine is a great choice for those who love drinking delicious coffee and don’t want to compromise on taste. The Curtis is an electric coffee machine that’s excellent for epicures, office workers, and early risers who take pride in the design and reliability of the machine. If you’re the type of person who wants to enjoy intensely flavored espresso shots, but also have the convenience of versatility and durability, then good news. The Wilbur Curtis allows you to luxuriate in the richness, boldness, and delicious flavor of coffee every time you decide to use it. Given the fact that this model can prepare coffee much faster than other coffee machines out there, it’s certainly a great choice for anyone who’s on the run, but doesn’t want to compromise on the taste and aroma of their morning coffee. Thanks to the Gold Cup SeriesTM, you can easily control each aspect of the brewing process. This includes the volume, the temperature, but also the brewing time and anything from the pre infusion to the pulse brewing process and more. With Precision Programming, you can rest assured that you can adjust the brew functions, the temperature, but also the volume, and time appropriately to brew a perfect tasting cup of coffee. Thanks to this level of customizability, the Curtis is an excellent choice for commercial applications such as restaurants and coffee shops. Unauthorized adjustment is effectively prevented thanks to the fact the machine comes with a changeable access code. Therefore, you can easily use the Curtis in a home, office or restaurant setting without having to worry about the fact that people can tamper with the settings. Thanks to the digital control module, you have precise control overall every part of the brewing process. As a result, you can rest assured that you’ll be able to brew coffee that tastes absolutely amazing every single time. Prevent unauthorized access and ensure that no one tampers with your coffee machine’s settings thanks to the changeable access code. Out of the box operation means that you can start using the machine as soon as you take it out of the box. The Wilbur Curtis has a esthetically limited design and it looks like it’s a nineties coffee machine. Given the fact it has a large footprint, you need to have a large countertop if you want to use it in your kitchen. Final Verdict: Should You Buy This Model? When you cannot compromise on the taste of your coffee, but you also don’t have a large budget to spend on a top of the line coffee machine, then you can rest assured that the Wilbur Curtis can deliver the taste and aroma rich coffee you like without breaking the bank. The machine focusses on the high volume commercial coffee provider rather than the custom beverage sector. Among the many things that make this such a great machine is also the fact that it features a great user interface, it can brew coffee fast, and it’s well made. The company’s Curtis Care program ensures that you’re going to enjoy using your machine for as long as possible. Furthermore, you can easily get in touch with a customer support representative whether you have any questions about the machine or maybe having trouble with it. Whether you’re into cappuccinos or other coffee drinks, the Wilbur Curtis is the right choice whether you plan on using it at home or at the office. Highly recommended! If you have a large budget and you’re also the type of coffee drinker who doesn’t want like compromise, then you may want to consider the ECM Profi IV. This machine is on a whole different level and it’s actually well known for its ease of use and the aroma and flavor rich espresso shots it can pull. If you decide to use it in reservoir mode, you can take advantage of the passive pre infusion feature which extracts the maximum amount of flavor from the coffee. Given the fact the machine is made of high quality stainless steel means it’s going to last you for many years. Even better, it perfectly complements your setting as well! Featuring three lower warmers and made of high quality stainless steel, this machine is the right choice for anyone who wants to prepare delicious coffee fast and without having to worry about breaking the bank to make that possible. Speaking of which, the VP17-3SS3L is just below $300, making it the ideal choice for coffee lovers who don’t have a large budget to spend on a top of the line coffee machine. Furthermore, the VP17-3SS3L is portable, it has the capability of brewing fourteen point four liters of coffee an hour or 3.8 gallons of coffee an hour and it’s very easy to use as well. It’s very important to mention that this is an amazing coffee machine, yet it doesn’t come with decanters. Therefore, you’ll need to buy them separately. Among the many features you’ll love about it, the machine is made of stainless steel. This means that it’s not only very attractive and looks great regardless of where you want to use it, but it’s also a breeze to clean. Highly recommended! Coffeeonfleek.com is a participant in the Amazon Services LLC Associates Program, an affiliate advertising program designed to provide a means for sites to earn advertising fees by advertising and linking to Amazon.com. Aeropress vs French Press: Which Makes the Best Coffee?